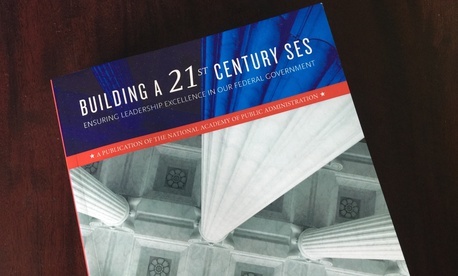 This is the final installment of Government Executive’s series of excerpts from the National Academy of Public Administration’s new book, Building a 21st Century SES: Ensuring Leadership Excellence for Our Federal Government. It was my great privilege to edit (and contribute to) that book, which includes 23 recommendations for reforming the federal government’s senior career executive system. As noted in the anthology, these recommendations are mine and mine alone, not because I have any pride of authorship, but rather because I am not so presumptuous as to assume that any of my contributors agree with them. If they do, so much the better, but I will leave that for them to say. In any event, I take full responsibility for their content. In that regard, it is only fitting that we end this series where we began, with our original premise: That 21st century government, with all of its challenges, will require a career senior executive corps like no other before it, one whose members are capable of leading across the whole of government if they are to effectively address those challenges. Even those career executives who have a singular agency focus (and there will always be some) will have to be able to demonstrate the acumen to lead across boundaries as all of the things government does become more and more interconnected, co-produced, and net-centric. The good news is that this is exactly what the original architects of the Senior Executive Service had in mind when they conceived of it almost 40 years ago. The bad news: We have never fully realized that vision, and, given the challenges we face, we cannot afford to wait any longer to do so. As technically capable as today’s SES members may be, most of them have not been formally developed and prepared for this brave new boundary-spanning world. That should come as no surprise. The governmentwide regulatory framework that drives their development is largely agency-centric in execution, setting broad policies but devolving important day-to-day decisions—like who gets schooled and promoted into the SES, how they are rewarded and deployed, etc.—to the agency level. The Office of Personnel Management (and in some cases, the Office of Management and Budget) provides oversight regarding those decisions, but execution of today’s senior executive framework is largely decentralized. As such, it is simply not conducive to developing an executive corps with a whole-of-government perspective or the leadership experience and expertise to operationalize it. As a consequence, I believe that there is a looming leadership gap, and it is both qualitative and quantitative in nature. Quantitatively, this gap may be most acute in the short term, if the ever-expanding SES retirement bubble is burst by the trauma and drama of presidential transition; however, there is evidence of something more systemic—and potentially more worrisome—at work: that is, the alarming number of top-notch GS-14s and 15s (especially women and minorities), logical successors to today’s executive cadre, who may no longer aspire to SES rank. But over the long term, the qualitative gap may be even more serious if and as our current system continues to clone career executives with an exclusively agency-centric perspective and skill set. How does the federal government close those gaps? In each of the sections of Building a 21st Century SES, our contributors and I have offered a number of observations in that regard, and I have taken the liberty of translating them into 23 recommendations. These are detailed at the end of each section of the book; however, I have summarized them below, and in so doing, I note that the vast majority of these recommendations require no special legislation—just the political and organizational will to implement them. It remains to be seen whether the new administration will actually do so. The challenges so well documented in Section 1 of Building a 21st Century SES paint a daunting picture, one of a federal government that will be exponentially harder to lead, and they make it clear that we will need a whole-of-government senior executive corps to do so. Given the agency-centric nature of today’s SES, that will require a years-long transformation, perhaps even a generational one. But we must start now. Here’s how we can begin to build it. Start with a Whole-of-Government Executive Talent Management Strategy. Such a strategy should cover every aspect of executive talent management, from development, acquisition and compensation to retention, accountability and deployment. And most importantly, it should do so from a whole-of-government vantage. Note that this strategy is not the same as a set of government-wide SES policies, but rather would include a set of clearly defined enterprise goals, objectives, and outcome-based performance metrics to evaluate the state of the government’s senior leadership corps. And given its enterprise focus, this is something the President’s Management Council is best positioned to take on (with OPM technical assistance, of course). The good news here is that President Obama’s executive order on the SES (EO 13714) already vests a subset of the PMC to focus on the senior executive corps. This will give it something to do. Establish a Permanent Mechanism to Engage Career Executives. This too seems obvious. Career executives should have a seat at the big table where big decisions are made—indeed, I think their institutional role demands it. And in so doing, they should be engaged like they’re actually part of the executive branch’s leadership team, as opposed to yet another employee stakeholder group (if that sounds elitist, so be it). Once again, there’s good news: The SES Advisory Committee established by EO 13714 was a good, albeit ad hoc start, and it could easily be institutionalized as a permanent mechanism to involve and engage the senior executive corps. It is clear that the original vision of the SES—as a mobile corps of “super” public servants moving from challenge to challenge—is as much or more relevant today than it was at the Senior Executive Service’s inception. But what about the unique institutional role for the SES implied by that vision—a role grounded in such core administrative values as the rule of law and the public interest? Is it still valid in 21st century government? The answer, at least according to our contributors, is an unequivocal yes. However, it is not clear that that role is clearly understood by those who must embody it. That too must change. Frame and Formalize the Institutional Role of the SES. The critical role career executives play in our system of government needs to be further explicated, understood, and ultimately formalized in law or regulation if it is to be preserved and protected. And while there is some risk in doing so, it would be worth it if that meant elected officials (and their staffs), the media, and, most importantly, our citizens had a greater understanding of the role and just how vital it is. A bipartisan commission could help in that regard. Teach Career Executives What It Really Means to Be One. That institutional role must not only be described to career executives and other internal and external stakeholders but also become part of the individual career executive’s leadership DNA, inculcated and internalized in the senior executive corps itself. This is the job of the Federal Executive Institute. Once a prominent feature of FEI’s flagship Leadership for a Democratic Society program for new or soon-to-be senior executives, the institutional role of the SES should take center stage again. With OPM’s renewed emphasis on executive onboarding and continuing leadership education, the platform exists for it to do so. Appoint Career Directors General as Stewards of the SES’ Institutional Role. While a governmentwide policy framework already exists to regulate the senior executive corps, that framework is operationalized at the agency level. That is where senior career executives face difficult, “do the right thing” dilemmas every day, and as such, that is also where the executive’s institutional role is potentially most at risk. Someone needs to be made officially accountable for preserving and protecting that role—not as a compliance cop, but rather as steward, mediating and moderating between appointees and careerists so that both may fulfill their institutional obligations. The Foreign Service’s Director General plays such a role in the State Department, and it is worth replicating in other agencies. The world is changing at a dizzying pace, and today’s senior executive needs to be able to demonstrate leadership qualities that we couldn’t even imagine 10 or even 5 years ago—cutting-edge competencies like managing crises and complexity or achieving enterprise unity of effort without formal authority. At the same time, they must also demonstrate competencies that are as enduring as our system of government—qualities like courage and character. Both sets should be reflected in the Executive Core Qualifications that serve as the admissions test for the SES. Unfortunately, neither are, with implications that are subtle but important. Here’s how we can fix that. Put Public Service Back in the ECQs. A career executive’s institutional role requires a set of leadership competencies unique to public service. In that regard, most would concede that it is much harder to get things done in government, and not just in a bureaucratic sense. Career executives often work in paradoxes, striving to strike a balance between such things as the rule of law and service to the government of the day. This is deliberate (the ‘intelligent design’ of our Constitution clearly says as much), yet OPM’s ECQs no longer reflect that unique public-ness. Competencies that are institutional in nature and exceptional to government need to be made part of the ECQs once more. Constantly Modernize the ECQ Framework. While a career government executive’s institutional role should be relatively enduring, that executive’s instrumental skills must also be continuously refreshed to reflect rapidly emerging leadership demands. Yet the ECQs haven’t changed since their inception. While OPM has made incremental (and mostly positive) changes to the two dozen or so now-exclusively instrumental competencies that currently compose the ECQs, those competencies need to be regularly and rigorously refreshed, with a particular eye toward what’s on and over the horizon—what tomorrow’s executives will need to be able to do, rather than what made today’s executives successful as they came up through the ranks years ago. Establish an Enterprise Leadership ECQ. Today’s career executive must lead in a whole-of-government world, but few have been deliberately developed and prepared to do so. This requires a set of “enterprise” leadership competencies that are arguably unique—like building and leveraging cross-agency networks or achieving unity of effort without formal authority—but the ECQs make no distinctions in that regard. If we do lead in a whole-of-government, even whole-of-nation world, then the ECQs should be amended to reflect that reality, to include adding a sixth ECQ, perhaps entitled Leading the Federal Enterprise, that requires evidence of an executive’s ability to do so. Require Due Diligence to Assess an Executive’s Character. Finally, to be successful, senior leaders (especially those in government) also require character—indeed, their followers should demand it. While character has a certain “we’ll know it when we see it” quality, we certainly read about it when a leader lacks it. As a consequence, it should be an integral part of SES screening, selection, and onboarding—and formally assessed as part of a comprehensive “due diligence” process during the executive’s first-year probationary period—as a fundamental in-or-out requirement for retention in the SES. If 21st century government requires a mix of enduring and emerging leadership competencies, especially those associated with the ability to lead cross-agency, whole-of-government efforts, how do we go about preparing career executives to effectively demonstrate them? Almost by definition, such a whole-of-government developmental model requires some form of managed mobility and the enabling policies and administrative mechanisms to make it work. This demands a whole new leadership development model—one that is far less agency-centric in nature, in which career executives (and perhaps even more importantly, their potential successors) are treated as corporate assets and prepared accordingly. Build a Whole-of-Government Executive Succession Plan. We know it takes deliberate, strategic succession planning and execution to prepare future leaders. While most agencies have decent succession plans today, the executives (and executive candidates) they cover are strictly “for internal use only.” If we want to develop career executives with a whole-of-government skill set, the PMC needs to build a comprehensive inventory of current and prospective career executives; identify critical gaps against anticipated demand, both qualitative and quantitative; and develop a comprehensive plan to ensure the federal enterprise has an adequate interagency pool of succession candidates, especially for those key executive positions that have whole-of-government responsibilities. Make Interagency Mobility a Prerequisite for SES Promotion. For the federal government to prepare career executives to effectively address all of the critical whole-of-government and whole-of-nation challenges it faces, it should make some form of mobility a prerequisite to becoming a member of the senior executive corps—just as the U.S. military, Senior Foreign Service, and U.S. intelligence community do. This mandate should at least apply to those positions that entail whole-of-government responsibilities, and it should be enabled by the mundane but no less essential administrative mechanisms necessary to make mobility work. Raise the Bar for Agency CDPs. In theory, relying on a Candidate Development Program pipeline to ensure an adequate supply of qualified SES successors would seem more strategically effective (and significantly less time consuming) than posting individual SES vacancies on an ad hoc basis. However, the track record of CDPs has been relatively subpar, with most CDP graduates never promoted to the SES. Taking a lesson from those few CDPs that are effective, OPM should condition continuing CDP certification on a stronger linkage to pre-CDP succession planning, as well as to a sustained high SES placement rate. Build an Internal Headhunting Capability for SES Jobs. Something is wrong when SES candidates think their odds of winning the lottery are better than applying for SES vacancy announcements in USAJOBS. If you want to improve those odds, you have to find and match talented applicants to real openings that best fit their skill sets. That’s what headhunters do—they know the best candidates aren’t trolling the want ads—or USA Jobs—for their next challenge. OPM could follow suit by establishing an internal, fee-for-service executive search operation to ferret out, recruit, and match outstanding SES candidates (especially women and minorities), to SES opportunities. Resurrect the Government-Wide CDP. An internal headhunting capability would help, but so too would a government-wide CDP. OPM tried one once and, while it had its flaws, we’ve learned much since, especially from recent efforts like the PMC’s Interagency Rotation Program and the White House Leadership Development Program—not to mention the stillborn Senior Presidential Management Fellows Program. It wouldn’t take much to take the best of these programs—as well as what we’ve learned from those relatively few CDPs that actually work—and resurrect a government-wide CDP. It’s sorely needed, especially for those smaller agencies that can’t afford their own. Delegate But Certify Agency SES Selection Processes. OPM’s efforts to streamline the SES application process are commendable. Resumes are fine (up to a point), as are alternatives to an OPM qualifications review board, but both have their downsides. In that regard, it’s time to give agencies wider latitude in the way they search for, recruit, screen, and assess candidates. OPM should still set rigorous, outcome-based standards, much as it does with delegated examining authority for rank-and-file civil service jobs; however, it should let agencies figure out how they’ll meet those standards and forego central QRB certification of their SES selections if they do. It is clear the nation needs the very best and brightest senior career executives at its helm. But will they be there when we need them? And will they have the core values and competencies to lead the whole of 21st century government? Is the system—or more accurately, the systems—that produced today’s executives up to the challenge of keeping them at the top of their game on into the future, especially if the focus has shifted from agency to enterprise? I would argue that the answer is no, and that the whole of the various systems that govern how senior career leaders are developed, selected, deployed, motivated, and, yes, held accountable, is in need of some serious reimagining. Establish a Federated Whole-of-Government SES Framework. While the nation requires a whole-of-government senior service—a senior federal service—to lead it, more than half a dozen alternative senior services currently coexist with the SES, each of them administratively walled off from it as well as each other. The result is a Balkanized, largely immobile executive corps that remains predominantly agency-centric in both orientation and operation. These various senior services need to be unified under a federated executive talent management framework that integrates the government’s senior services into a single corpus—bound together under an umbrella of common institutional principles that enable cross-agency development and deployment. Establish a Master Interchange Agreement to Connect Senior Services. A common, unifying framework is necessary to integrate the federal government’s various senior services, but it is not sufficient. In addition, the barriers between those senior services must be made more permeable. OPM can fix this administratively by establishing a master Executive Interchange Agreement that links all of these senior services together, making the borders between them far less impermeable. In so doing, OPM would enable an executive in one of those services to move to a permanent position in another with relative ease—and without any further competition. Establish a New Governmentwide Senior Executive Structure. A senior federal service also needs a new, common architecture that departs from the level-free open range currently in place. The original idea of that open range was to give agencies the discretion to tailor their own rank levels and salary control points to fit their different missions; however, most have ended up with more or less the same three-tiered structure. That structure should be formalized and a fourth tier added that would permit a relatively small number of enterprise executives to progress to Executive Level (EX) I. This would require legislation (one of the few recommendations here that does), but EX I would only be for a relatively elite group of between 1,000 and 1,500 career executives that have governmentwide, cabinet-level leadership responsibilities and impact. Appoint an Enterprise Executive Resources Board to Manage Career Executive Talent. This four-tiered, federated architecture requires a governance structure that can manage the federal government’s executive talent for the enterprise a whole. Today, individual agency Executive Resources Boards perform this talent management function for their own career executive cadres. The president or OPM could establish a new Enterprise Executive Resources Board, drawn from the PMC but co-led by an equal number of career executives, to manage select senior career executive talent—with particular attention paid to those elite Tier 4 executive positions that have whole-of-government responsibilities. Make Incremental Fixes to SES Compensation. Our career executive compensation system is clearly broken, and it needs more than a new pay cap at EX I. That’s a start, but Congress has seen fit to authorize some agencies—like the Department of Veterans Affairs and the Financial Institutions Reform, Recovery, and Enforcement Act agencies—to raise senior executive pay substantially in order to better compete with the private sector. FIRREA-like pay levels may be a bridge too far, but short of that, the EERB could be given streamlined authority to approve so-called critical pay requests up to and above the vice president’s level; that’s already allowed by law but rendered nigh impossible by bureaucratic constraints. Provide Peer Review for Greater SES Accountability. For reasons that may be arguable, Congress has sought to make career executives more accountable. That’s code for making it easier to fire them. But in principle, that goal is not illegitimate. Most career executives would agree that they should be held to the very highest standards, and a years-long adverse action appeals process is hardly conducive to that core principle. In its stead, the adverse actions of career executives should be judged by a jury of their peers—that is, a tribunal of other career executives who would judge the conduct and/or performance of a career executive in terms of his or her fitness for office. This would require legislation, but career executives would likely find this far more acceptable than some of the legislative proposals circulating on the Hill. As noted, when it comes to building a 21st century senior executive corps, the vast majority of the recommendations set forth above require no special legislation. However, that doesn’t mean they are easy to implement. If they were, OMB or OPM would have already done so. Nor does it mean legislation wouldn’t help…the few recommendations that do require an act of Congress, like raising the pay cap to EX I, are crucial to the continuing viability of the senior executive corps. Realistically, it is unlikely that the next administration and the next Congress will take steps to modernize the SES just because it’s the “good government” thing to do. That’s not an editorial comment, just a political reality, and it will likely take some sort of impetus—a scandal, a major management failure, some dire threat—to fuel the discussion. However, that opportunity may come sooner than later. It may even be upon us now. As problematic as some of them may be, the various legislative efforts to diminish SES appeal rights may have a silver lining. If they’ve done nothing else, those efforts have opened the door to additional reforms, especially as a quid pro quo for greater SES accountability—and as a way to get greater buy-in from an anxious executive corps. Recall that it was just such a grand bargain in 2004 that raised the SES pay cap to EX II in exchange for greater performance management discipline, and there is an opportunity to follow a similar path today. Thus, if Congress attempts to go beyond the VA to “improve” the adverse action appeal process for all career executives, the administration could propose legislation to (among other things) raise the pay cap to EX I for that select group of mobile enterprise executives who have whole-of-government responsibilities. However, if that doesn’t happen, a blue ribbon commission on reforming the SES could help—especially if it were drawn from the ranks of current and former senior officials. Now, some cynics would argue that a commission is just a politically expedient way to continue to “admire” the problems rather than solve them, but I have personally been involved in two commission-driven reform efforts—the restructuring of the Internal Revenue Service circa 1998, and the integration of the intelligence community circa 2004—and both were reasonably successful. Granted, both efforts were driven by something much bigger than personnel problems (a scandal in one case, a tragedy in the other), but both included significant personnel reforms as part of the statutory solutions their commissions recommended. VA is following a similar path. Indeed, to its credit, the Commission on Care focuses on leaders and leadership development as a key part of its recommendations. So commissions can work, especially if they speak with respected, bipartisan voices on issues that an administration, Congress, and the people care about. In sum, it is clear that the SES and its sister senior services (most designed in the last century) need to be transformed if their members—not to mention the federal government and the nation as a whole—are to meet the challenges of the 21st century. And at the risk of being a bit Pollyannaish, I believe that there is some cause for optimism in that regard. First, whether or not one agrees with the recommendations set forth above, they demonstrate that much can be done administratively to jump start the transformation of the SES; to be sure, much has been done already, but I would venture that even (perhaps especially) those who have led those changes would acknowledge that more is necessary. But the fact that much of the “more” can be done without legislation means that further progress is possible. It’s just a matter of will. In addition, there are those who have served in all branches of government and on both sides of the aisle who truly care about this issue. They want to see an SES that is up to the challenges of 21st century government. That certainly includes those who took the time and effort to contribute to this anthology, all of them highly regarded and respected in their own right—and now speaking as one. Do they represent a groundswell of support for reform? Not yet, not even close (at least not until the next scandal or management failure), but their voices carry disproportionate weight when it comes to matters of good government, and that too improves the chances of success. And success is imperative. Year in and year out, the vast majority of career executives remain as selfless and dedicated to their cause as the day they first took the oath, and they will continue to labor and lead in the trenches without worrying about the prospects for reform. The best of them can make even the most decrepit system work, but only for so long. So we owe them—and the American people, whether they know it or not—our best efforts. And our best leaders. So let’s get started. Ronald Sanders is a fellow of the National Academy of Public Administration and a vice president at Booz Allen Hamilton.